Goals are managed on the Goals & Alerts page, accessed by the selection from the Tools menu. 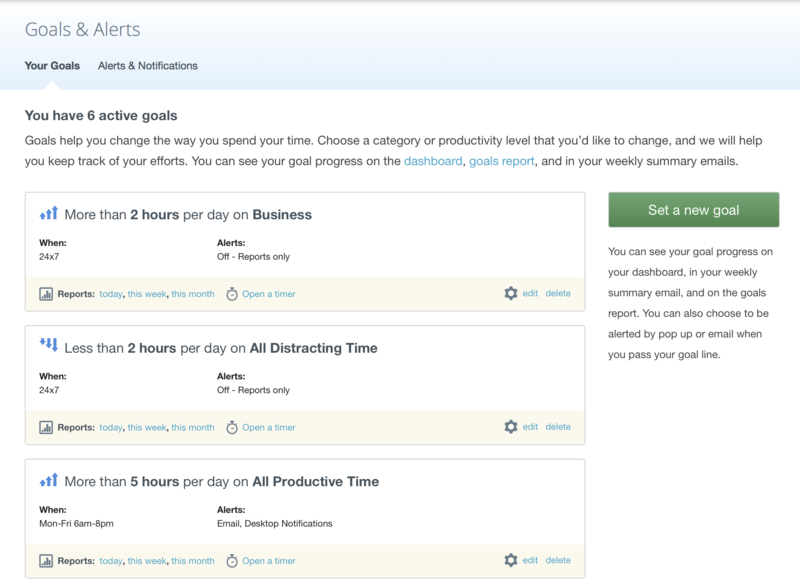 The Goals & Alerts page shows a list of your goal details and links for goal functions. From the primary goals page you can access the Goals report, edit, delete, or create a new goal. You can even open a daily timer for a specific goal. The timer will track your goals progress in real-time updating the onscreen widget. To create a new goal click on the "Set a new goal" button to open the goal creation window. You set the parameters for a goal, and select it to be more or less than a specified period of time. Time is entered in hours using the hour's field which is editable and where you can type in a custom number of hours using decimal format. There is a category drop-down box used to select the category of an activity for the goal. This is what determines progress towards the goal - all activities matching that categorization will be cumulatively tracked as a measure of goal progress. The "during" box selection will set the time period when the goal is in effect. You can use this to make time-specific goals. Premium users can create custom goal schedules on the Advanced Filters page. There is a text field where you can enter details about why the goal is meaningful to you. You can use the Notifications checkboxes to turn on goal progress notifications via email or desktop message, though this is a Premium- only feature. 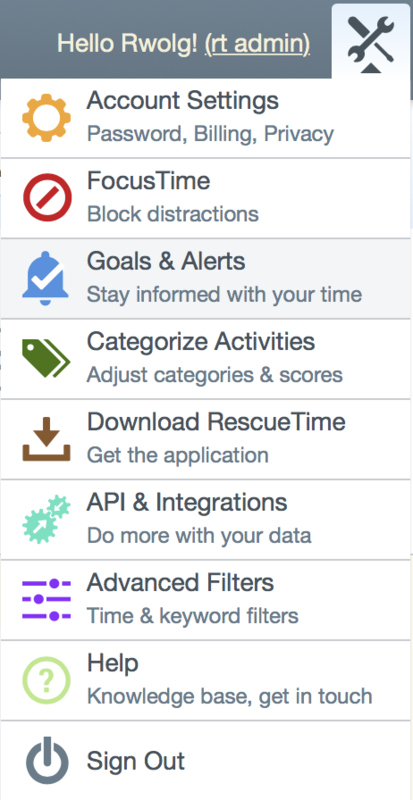 You can also create goals for activity categories and specific activities directly from the report pages where you see a green "Create an alert or goal" button. It will generate an Alert or Goal for the activity represented on the page.